Steel gold pans with big bottoms are patterned after the original tools used in the 1849 Gold Rush. 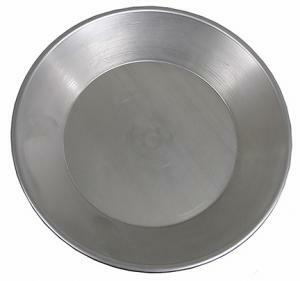 Made with unfinished 22 gauge steel, the size of the pan is measured from rim to rim (choose size from drop down menu). A larger pan such as this can hold more material and therefore allow for more production, but using a large pan filled with material gets heavy and tiresome over time, so also using a smaller pan would be handy as a finishing pan to separate gold from black sand concentrates. In addition to panning, steel pans also make great historic displays, awards, and art projects. Steel pans usually are impregnated with oil from the spinning process used in manufacturing, but this oil can be removed easily by heating a new steel pan on your stove top burner or with a propane torch until very hot. The heating will quickly burn away oil residue but will create a little smoke. As an option to heating, you could also try washing with a degreasing detergent.